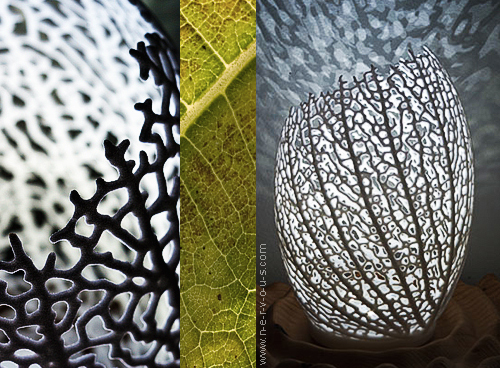 The Hyphae Lamp is an algorithmically generated design inspired on leaf vein formation. The growth principles used for 3D simulation are based on the work by Adam Runions of the Algorithmic Botany group at the University of Calgary, who devised a process based on the ‘Auxin Flux Canalization’ theory that explains venation as the result of the movement of the growth hormone auxin. Each lamp is individually grown through computer simulation, unique results are 3D-printed in nylon using Selective Laser Sintering process and illuminated by a 3,6W 200lm LED light. Dimensions: 135x 135x 203 mm.